House Speaker Rep. Matthew Shepherd addresses reporters gathered at the Arkansas State Capitol in Little Rock. 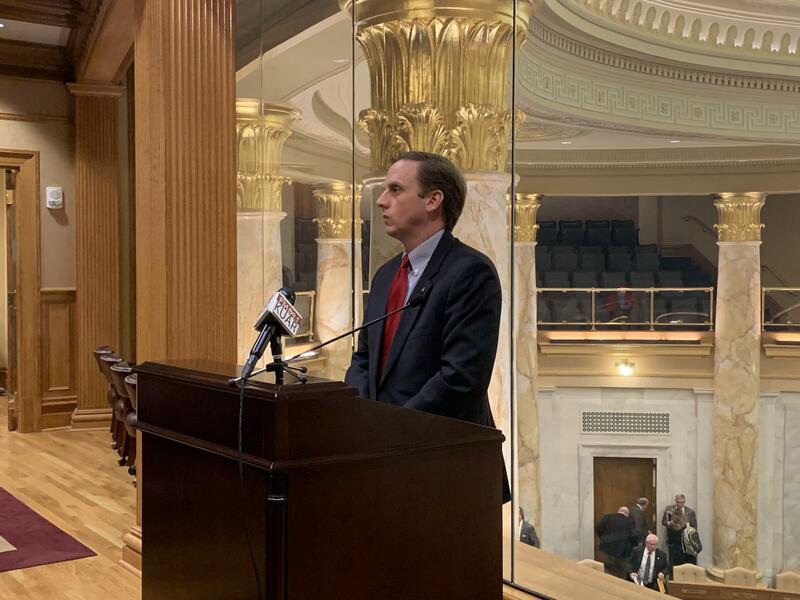 The new speaker of the Arkansas House of Representatives says the chamber is on its way to achieving two big goals as the Regular Session of the 92nd Arkansas General Assembly enters its fifth week. House Speaker Matthew Shepherd (R-El Dorado) told reporters at the Capitol Thursday that despite concerns from fellow Republicans, he remains optimistic that Gov. Asa Hutchinson's $97 million tax cut plan will pass the chamber. "It's a pretty heavy lift. There are some members that, right now, have some concerns. As I've mentioned in the past days, there [are] a lot of different interests out there. Some members are wanting to focus more on highways, so we're still in the process of trying to make sure we're all on the same page." Another priority outlined by Gov. Hutchinson before the session was a long-term funding mechanism for the state's highways. Hutchinson has expressed support for extending a half-cent sales tax past its deadline of 2022, while Shepherd believes there's a better solution. "As I said last week when we rolled out the tax cut, I felt like once we nailed down what the tax cut proposal was going to be, that that was going to assist us in being able then to focus on the highway issue. And I think it has," Shepherd said. "It's an ongoing discussion. I've mentioned that I think we need to transfer some revenue towards highways… but there [are] a lot of different proposals that are out there." Shepherd says the passage of the governor's tax cut plan would free up more time for legislators to focus on finding a lasting solution to highway funding. He also said he feels good about the pace of the session. "As Speaker, I tend to rely on my chairpersons to make sure they’re moving along through their agendas," Shepherd said. "I think… the fact that maybe there hasn't been a really big issue on the floor or anything that's really been particularly controversial, sometimes we can confuse that fact with, 'Well, the session’s slow.'" The bill to cut the state's top marginal income tax rate from 6.9 percent 5.9 passed the Senate on Wednesday, a day after it failed to gather the three-fourths vote needed to pass. It’s expected to go before a House committee next Tuesday. An Arkansas lawmaker has filed legislation that would ban abortion in the state if the U.S. Supreme Court overturns its landmark 1973 decision that legalized the procedure across the nation. Republican Sen. Jason Rapert's bill filed Tuesday would trigger the ban if the Roe v. Wade decision is overturned or the U.S. Constitution is amended to allow states to prohibit abortions. The Guttmacher Institute says four other states have similar trigger laws in effect.